The newly-published book, The Oxford Handbook of Early Modern Theology, 1600-1800, has arrived in Concordia Seminary’s Martin Chemnitz library. 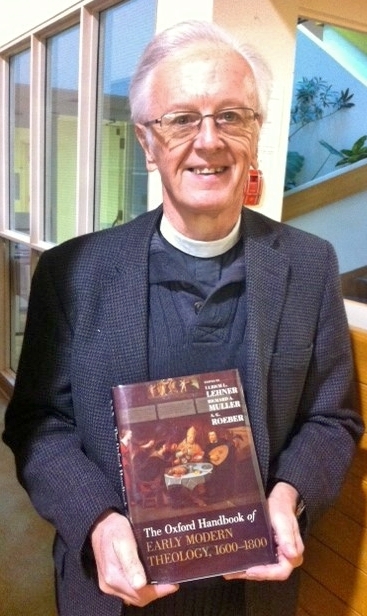 It includes a contribution authored by our own Professor of Historical Theology, Dr John R. Stephenson. Dr Stephenson’s article, “Sacraments in Lutheranism, 1600–1800”, is also featured in the electronic version, Oxford Handbooks Online: Scholarly Research Reviews. Oxford Handbooks is a collection of the best handbooks in 14 subject areas, including religion. Known as one of the most prestigious and successful branches of Oxford’s scholarly publishing, the Handbook series contains in-depth, high-level articles, with the latest research and writing from top scholars in their fields. Dr Stephenson holds degrees from the universities of Oxford and Cambridge, and earned his PhD from the University of Durham, writing on the Eucharistic theology of Martin Luther. Widely published, he is a Reformation scholar and an expert in the history of the Lutheran Church. His research interests include the history of Christian doctrine, Sacramental theology, and ecumenism. He has been a professor at Concordia Lutheran Theological Seminary since January 1989.